The Astrology of July features Pluto and Neptune, along with a powerful Mercury retrograde that lasts almost the entire month. This begins on the 4th (see chart ), as Mercury moves backwards through the first two degrees of Leo, and then on back through Cancer. Mercury stations direct on the 28th, still in Cancer, but does not leave its "retrograde shadow" until it reenters Leo in the second week of August. The Mercury retrograde time, including the shadow period, is well-known for mechanical and communication breakdowns, and for being a period of time when new ideas may be tentative, needing to be revised after the retrograde has passed. It is also an excellent time for reflection on our situation, where we are going in our lives and with Mercury in Cancer, how our tribal sympathy and emotional communication could be a bigger part of the entire picture than we are often willing to give credit for in our cultural over-dependence on purely rational results. Chiron is also emphasized in the early part of the month, opposed by Saturn and squared by a stationing Jupiter. Jupiter changes to direct motion on July 6th in Scorpio, and brings up deep connection with the core of our connection with others, and with our issues, especially our issues around authority (Saturn) and as well group participation versus solitary creativity, represented by the Leo – Aquarius polarity. This can of course be a confusing period. Since numinous Neptune is also emphasized in this monthly cycle, being opposed by Mars for the first half of the month, the confusing aspects are multiplied. On the upside, we might seek and even find the spiritual impulse behind and beyond the dysfunctional physical. Pluto, transformative agent of massive change, comes strongly into the mix of energies beginning with the Cancer-Capricorn Full Moon of July 10th, and extending up to the powerful Last Quarter Moon of July 17th. During this period of time, Venus and Mars configure with Pluto, emphasizing right relationship with others around us, another factor in the tribal call to greater unity with all of humankind, indeed with all creatures and life forms on the planet. The life of the planetary body, or Gaia, has been sorely neglected lately and is beginning to react, as is becoming increasingly evident even to our nation's so-called leaders. There will likely be more compelling evidence in the coming weeks of where we can do better both as a collective and, most importantly, beginning with each one of us individually. Last month the situation in Iraq continued to deteriorate, in keeping with the tenor of these climactic times, and as indicated by the transforming power of the outer planet configurations, with stronger calls for a U.S. withdrawal and fresh atrocities surfacing, while two kidnapped soldiers were unfortunately not released alive as were the initial hopes The movie "An Inconvenient Truth" that was released earlier this year also became well-known over the last two weeks of June, representing a wake-up call for the fossil fuel issue and America's dependence on oil rather than encouraging more sanity in the development of renewables. In this month's transits, the Mercury retrograde period may provide further food for thought for the American public, since it crosses over the U.S. Mercury degree three times in all, as transiting Pluto continues to aspect that same sensitive point in the U.S. chart. The Last Quarter Moon of July 17th is a particularly potent point in time within the retrograde period, when the Sun and Mercury are conjunct and square the Moon in Aries as the Moon also conjuncts U.S. Chiron. 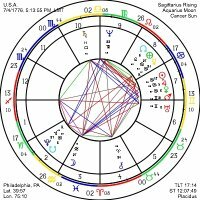 Since the Sun and Mercury also conjunct U.S. Mercury at this juncture, this is perhaps the crux of the retrograde period for the U.S. population, when there may be fresh considerations that are brought to light or else to public awareness.